Thanks to Oliver Waitze of the New Acoustic Gallery (NAG) in Wuppertal, Germany, for the December 2013 issue of its newsletter. 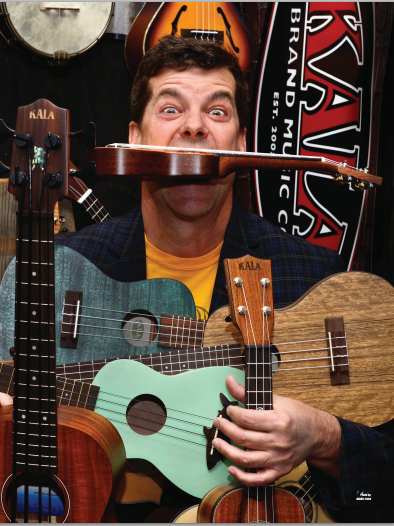 The NAG stocks the finest acoustic instruments and accessories for bluegrass, gypsy music, and other genres, offers a repair service, and organises workshops and concerts. Oliver wishes everyone a merry Christmas, with plenty of mandolins under the Christmas tree! 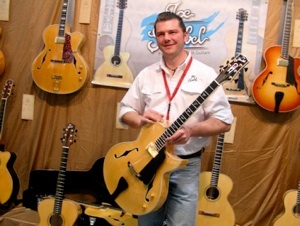 Some of the outstanding instruments that have recently come into stock include a 2012 Froggy Bottom H12 De Luxe; guitars by Joe Striebel (see photo above); an Obana CK-25 Z concert ukulele; a Weber Yellowstone A-style octave mandolin; a Romero open-back banjo; a 1927 Martin AA-style mandola; a Krishot blonde amber F-style mandolin; guitars by Bourgeois, Martin, and Furch; a Gibson RB-00 replica 5-string banjo; Eastman MD 315 and MD 515 mandolins; a Scott Cao antique cello; and a Kentucky Dawg A-style mandocello. The Jazz mandolin appetizers book/CD set by Don Stiernberg is also in stock. And of course the Trio Vibracao are available for bookings. They can be seen playing 'Ride the wild turkey' on YouTube. The NAG will be open till Saturday 21 December. More information is on the NAG website.